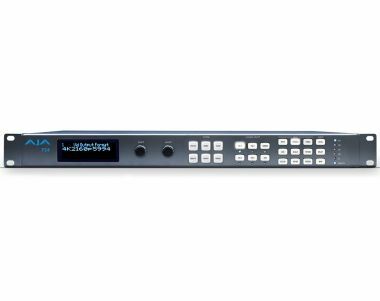 AJA’s flagship frame synchronizer and converter offers incredible versatility and connectivity in a sleek 1RU frame for all your 4K/UltraHD and 2K/HD/SD conversion needs. Offering a wide range of connection options for both video and audio, FS4 can do the work of four separate devices in 2K/HD/SD or combine all processors and channels together for maximum flexibility for 4K/UltraHD productivity. Four Channel mode offers 4x 2K/HD/SD channels of simultaneous conversion and processing, all within an elegant 1RU chassis for multi-channel high density delivery. Video and Audio deserve the connectivity and bandwidth required to meet the demands of your projects. FS4 utilizes standard BNC as well as optional SFP inputs and outputs to integrate easily into a variety of workflows and facilities with support for SDI worklows all the way up to 12G. FS4 has BNC and Fiber* inputs and outputs to accept 4K/UltraHD/2K/HD/SD resolution SDI signals in Single Channel Mode. In Four Channel mode 2K/HD/SD inputs can be routed to multiple locations simultaneously without the need for any external signal distribution. A looping Reference input allows the FS4 to be locked to your house reference signal for rock-solid stability.